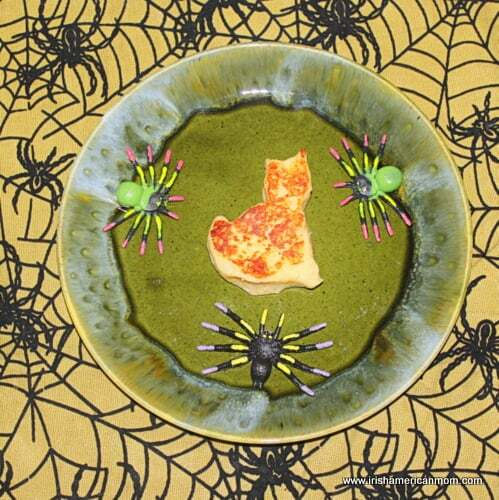 Halloween is a fun time for feasting on spooky treats. 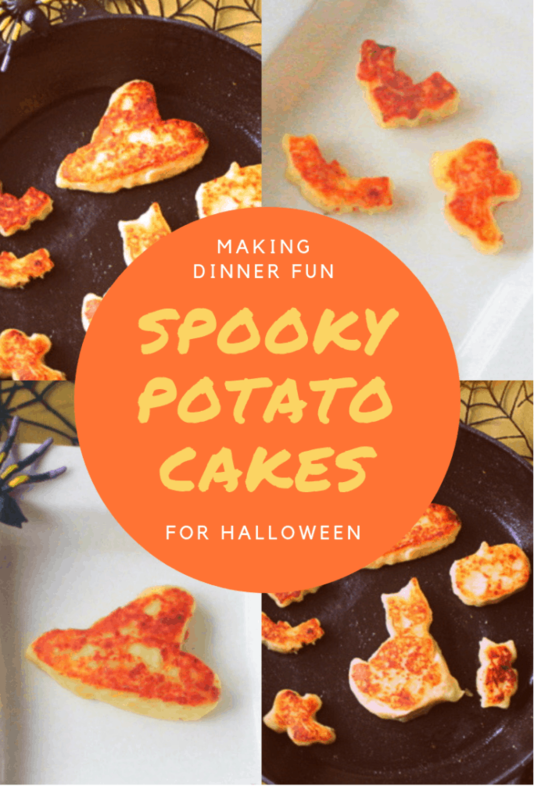 But why not make something wholesome and filling for little trick or treaters before they set out on their Halloween quest. 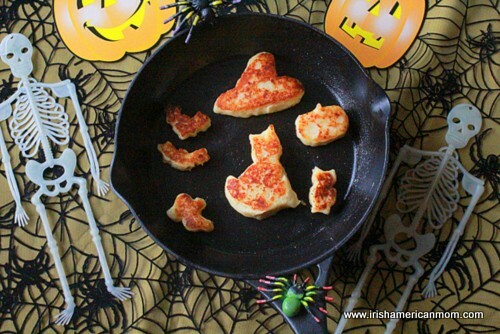 Cheesy Irish potato cakes in spooky novelty shapes are great for dinner on October 31st. 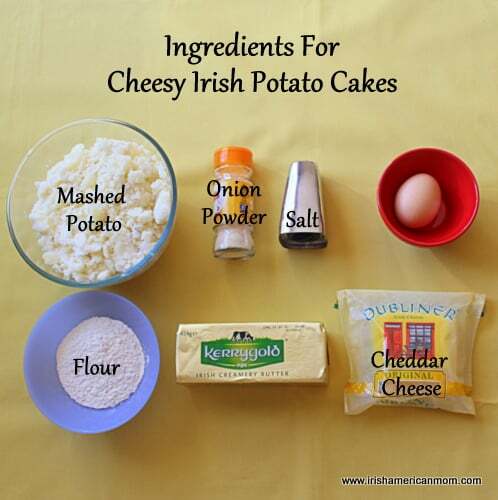 My Irish potato cake recipe is one of the most popular posts on my blog, so I thought why not share a little variation on this recipe, using sharp, Irish cheddar cheese to add a kid-friendly tangy flavor to these little morsels. In fact, depending on your cookie cutter selection, you could adapt this recipe to suit any holiday celebration. Candy canes and stars for Christmas, hearts for Valentines Day, and shamrocks to commemorate St. Patrick’s Day – the sky’s the limit. 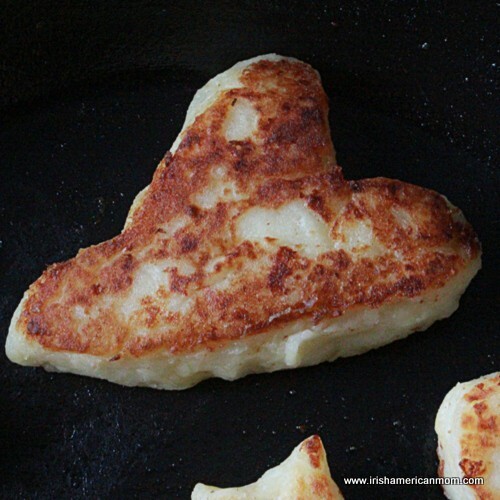 The ingredients are very simple – that’s why potato cakes were popular in Ireland years ago. Even the poor could make and enjoy these cakes. 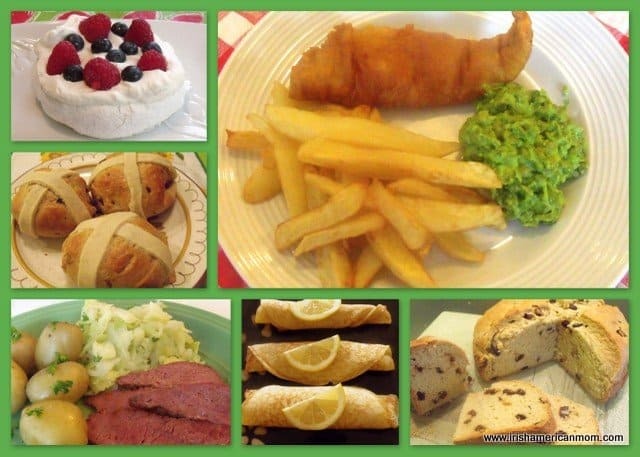 Our ancestors had no onion powder, but let’s face it, our Irish taste buds just love the combination of cheese and onion (my favorite crisp or chip flavor). 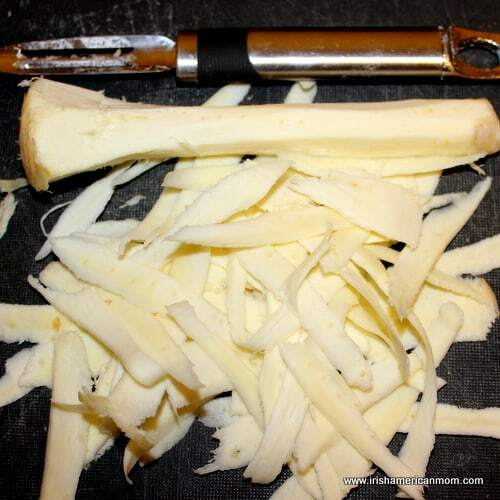 3/4 cup of grated white cheddar cheese (I like sharp Dubliner cheese from Ireland). 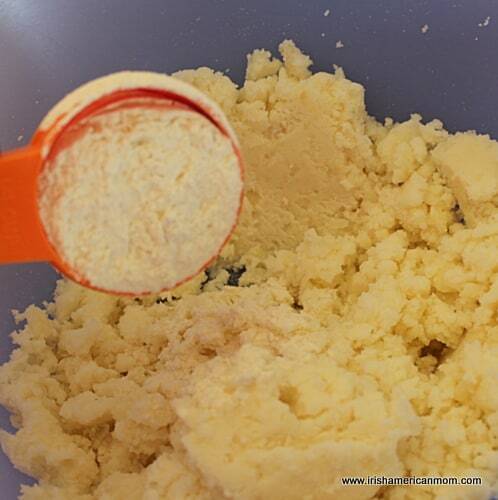 Toss the flour and mashed potato together in a large mixing bowl. Next season with onion powder and salt. 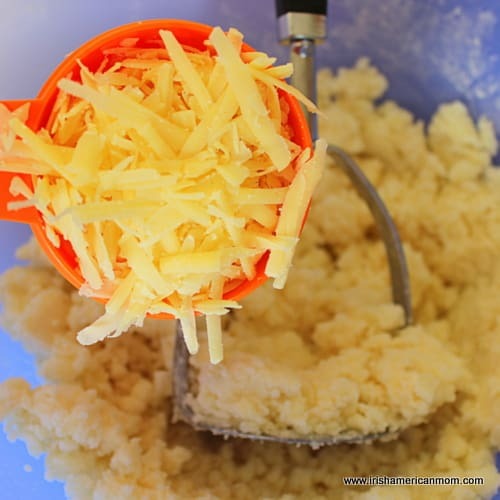 Mix the ingredients together using a potato masher, then add the cheese and mix it through. 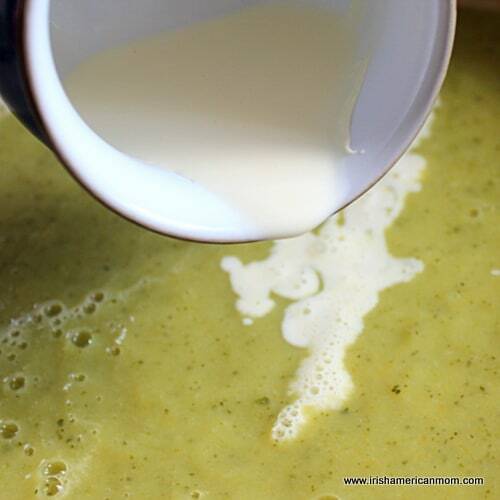 Add 1 ounce of melted butter. Add half the beaten egg. 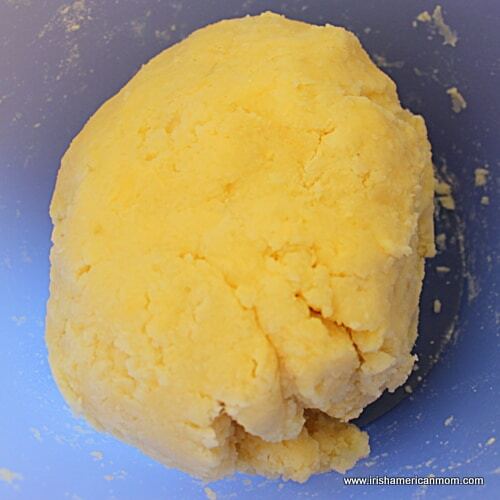 The amount of egg required to form a dough depends on how dry and floury you’re mashed potatoes are to begin with. I find Irish potatoes require more egg than American spuds. Anyway, mix the wet ingredients through the dry to form a dough. 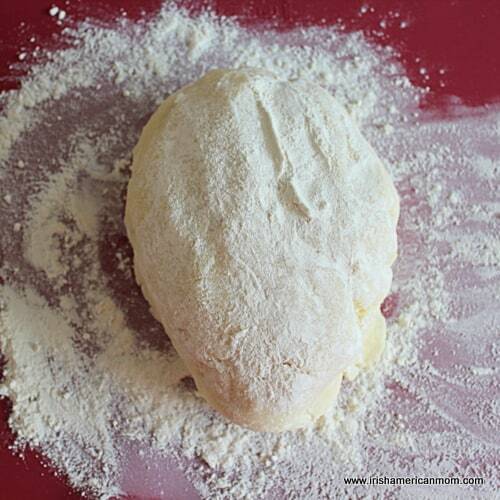 Turn the dough out onto a floured surface and sprinkle the top with more flour. Knead the dough gently. Then roll it to about 1 inch in thickness. I make these potato cakes a little thicker than my regular potato cakes, since the cheese makes them a little softer and more prone to breakages. Cut out shapes with novelty cookie cutters. 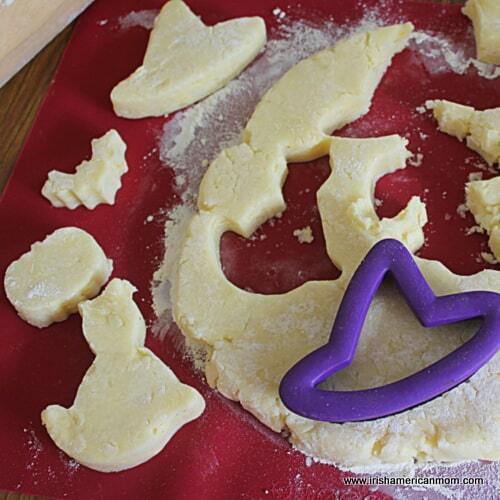 Gather the dough scraps, re-knead and roll to cut out additional shapes. 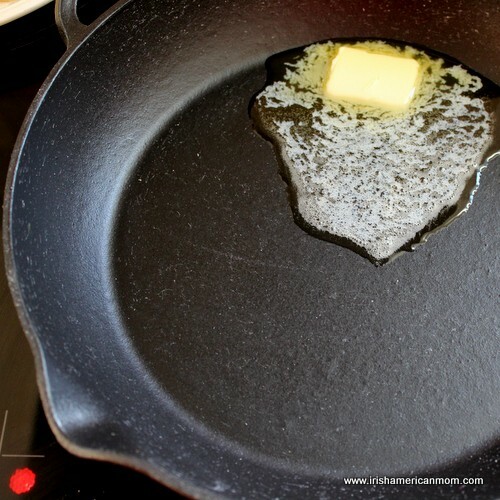 Melt the butter over medium heat in a large skillet. I love to cook these in my cast iron pan. 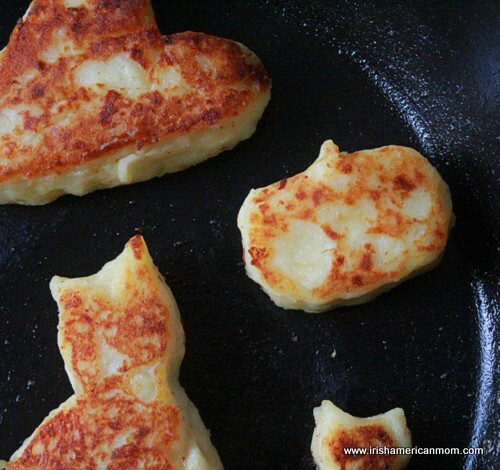 Fry the potato cakes in the pan for 3 minutes on each side over medium heat. They should turn a light golden brown. Once browned on each side I like to place the cakes on a baking tray and finish cooking them in the oven. Preheat the oven to 375 degrees F, so it’ll be nice and hot once you’re ready to pop the potato cakes in. I don’t do this for my regular potato cakes but I find the onion and cheese flavors meld beautifully after a little roasting. We made all kinds of Halloween shapes from pumpkins to owls. My cookie cutter collection was our only limitation, and if I was a little more artistic I’m sure I could have cut out some more spooky shapes. We made bats and ghosts. My cookie cutters for these shapes are very small, but they’re perfectly sized bites for small mouths. My little girl loved this Halloween cat. 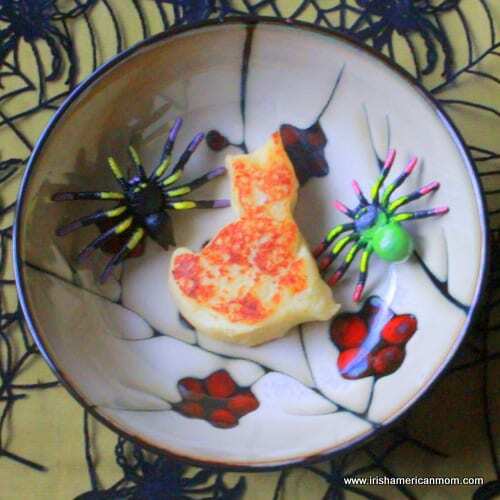 She loved this cat so much, a photo shoot with different plates and bowls ensued. And Dad loved the bigger sized witch’s hat. 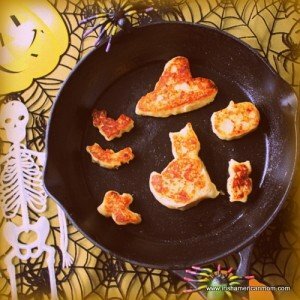 A few witch’s hats and a steak is a satisfying Halloween meal for any man. My West Cork granny would have had great fun serving these at Halloween. Oh, if only there were fancy cookie cutters back in her day. 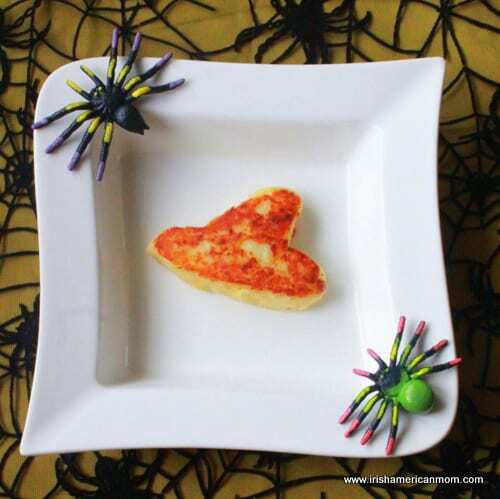 Hope you enjoy this spooky Halloween side dish. Cheesy Irish potato cakes in ghostly novelty shapes are great for dinner on October 31st. Step 1 Preheat the oven to 375 degrees Fahrenheit. 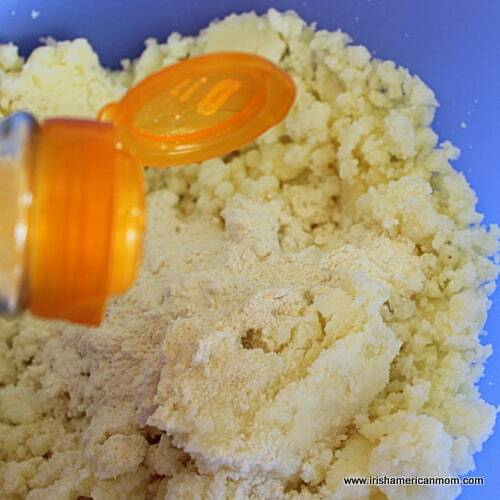 Toss the flour and mashed potato together in a large mixing bowl. Step 2 Season with onion powder and salt. 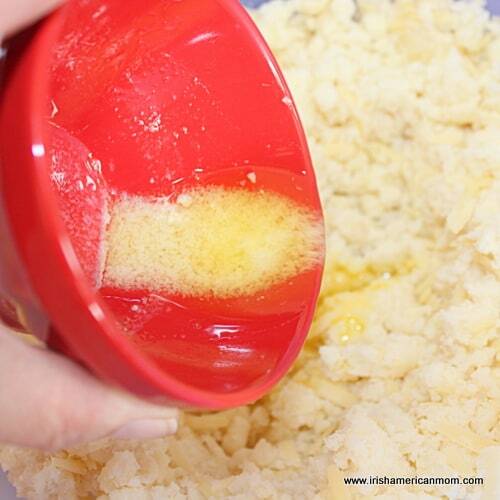 Step 3 Mix the ingredients together using a potato masher, then add the cheese and mix it through. 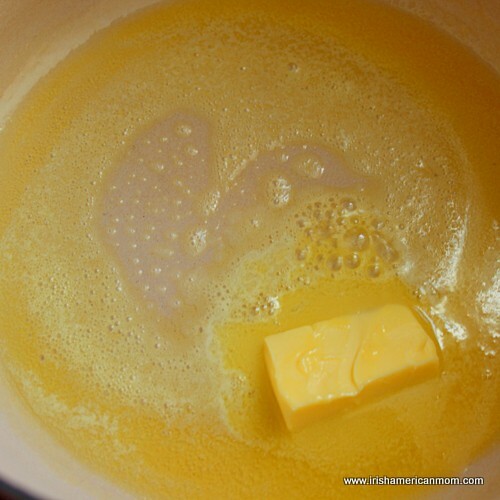 Step 4 Add 1 ounce of melted butter. Add half the beaten egg. 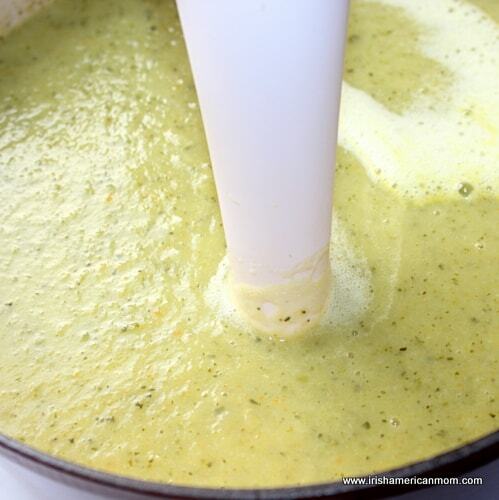 Mix the wet ingredients through the dry to form a dough. 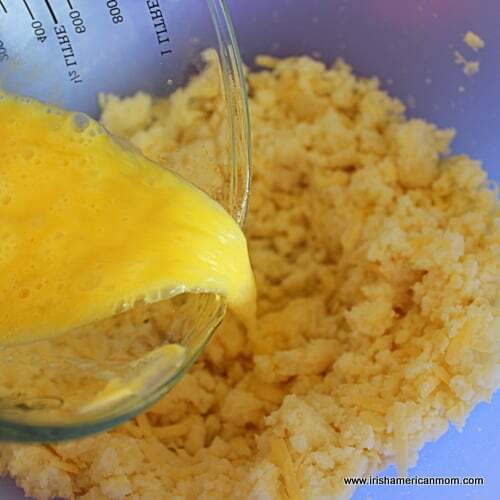 Add additional egg if needed to form a firm dough. Step 5 Turn the dough out onto a floured surface and sprinkle the top with more flour. Knead the dough gently. Step 6 Roll the dough to about 1 inch in thickness. Cut out shapes with novelty cookie cutters. 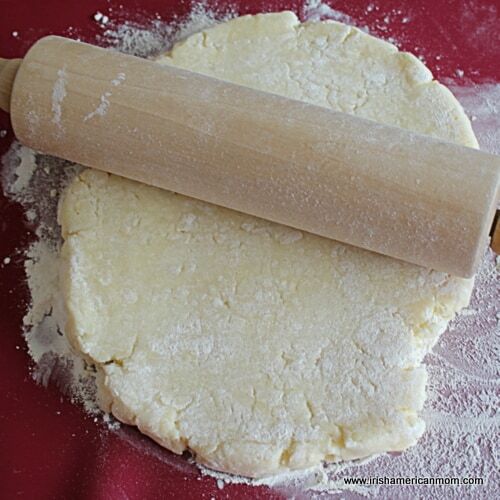 Gather the dough scraps, reknead and roll to cut out additional shapes. Step 7 Melt the butter over medium heat in a large skillet. 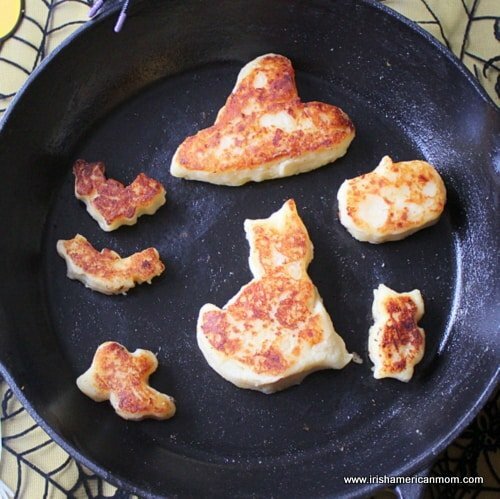 Fry the potato cakes in the pan for 3 minutes on each side over medium heat. Step 8 Place the browned potato cakes on a baking tray and bake for 10 minutes in the pre-heated oven. Step 9 Serve warm with ketchup or sour cream. 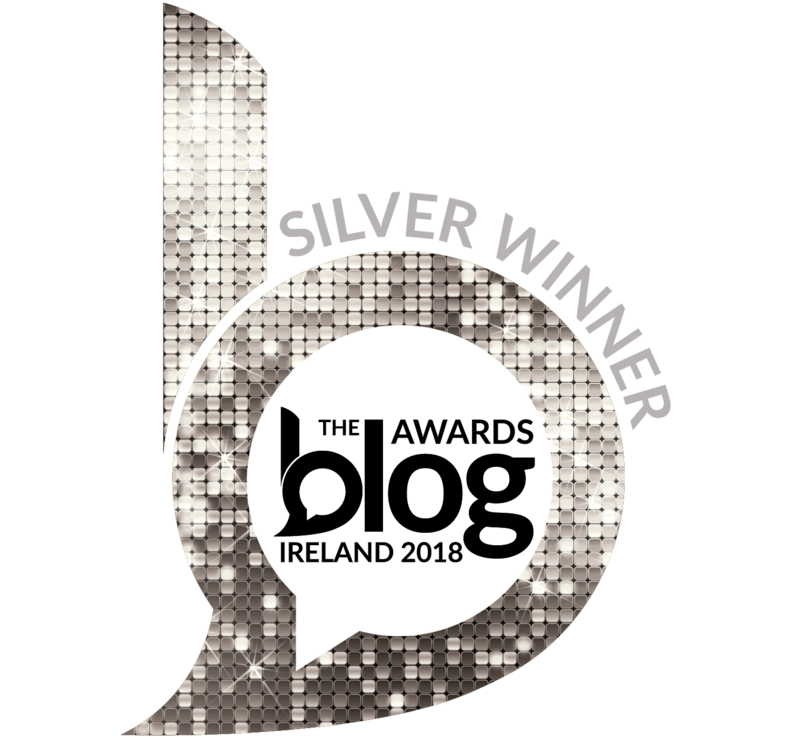 Move over Valentine’s Day – Halloween is nearly here, and in olden days in Ireland, this was the time of year for predicting romances, just waiting to flourish. 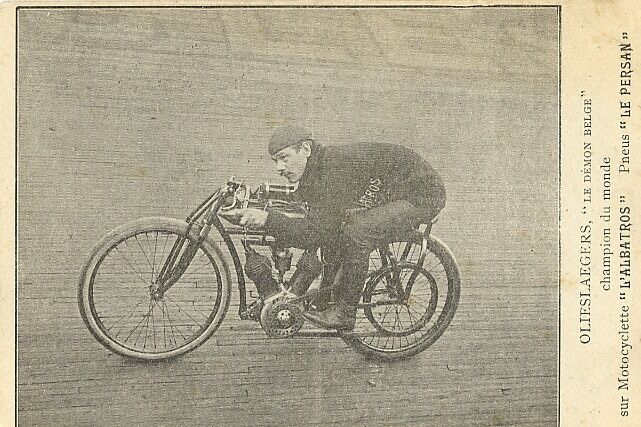 The Irish were, and still are, a very superstitious race. 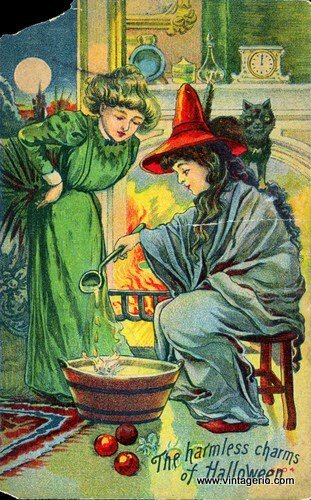 Since we will be celebrating Halloween at the end of this month (or all through this month, if you live in America), I thought why not explore some old Irish superstitions associated with this holiday, especially those centering around romance, love and marriage. Halloween is a great time for fortune telling and divination according to Irish tradition. 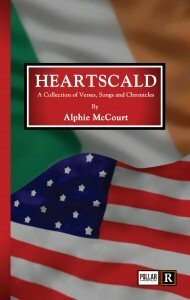 In days gone by Halloween night was a time when the Irish believed the future and past coincided, and for one night only every year, all time frames existed in the present. If the future collides with the present at Halloween, what better time could there be for looking into what the future may hold. For all those in search of someone special to share their future, Halloween is the best night of the year to try to figure out who might be waiting just for you. Well that’s what the Irish believed anyway. 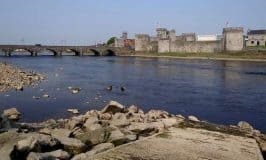 Here are some simple, romantic, prophetic tests from Ireland’s Celtic past and from around the British Isles…..
For those interested in finding out their future partner’s wealth then all you need is a good old cabbage patch on this magical night. Just follow these steps to find out what the future holds …..
Run into a field of growing cabbages. Search around the ground for a nice big head of cabbage, and yank it out of the ground, roots and all. Now, uncover your eyes, and check out those cabbage roots. If you extricate the vegetable with roots intact and a good amount of earth still attached, then your beloved will have oodles of money. But don’t get too excited. You still don’t know if he’ll be cranky or kind. 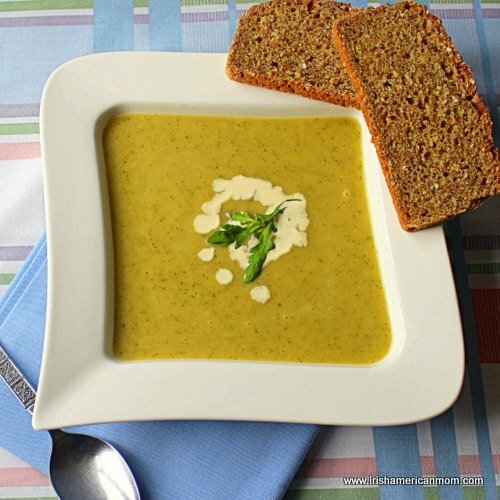 Head on home with your newly harvested cabbage and cook it up Irish style. If your cabbage is bitter, then I’m afraid a sour, old, so-and-so may be in your future. 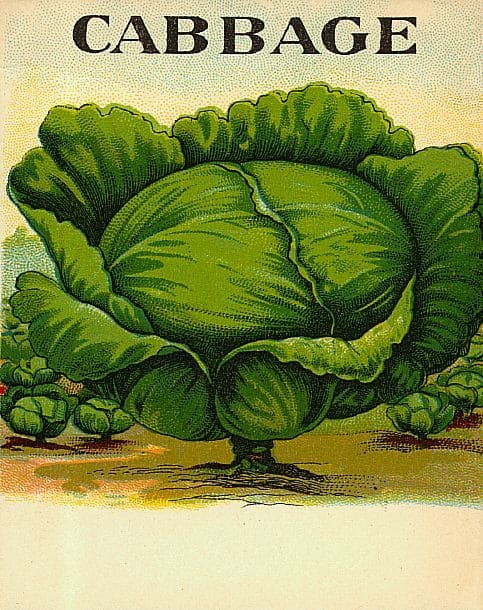 But if your cabbage is sweet, then your fate holds a kindhearted, loving mate. The cabbage test was easy to complete if you lived in rural Ireland many years ago, but I’m afraid we urban dwellers today have little access to cabbage patches. So then, your best bet for predicting love is to move on to the bonfire test. A Halloween bonfire is touted as a way to help envision a future partner. 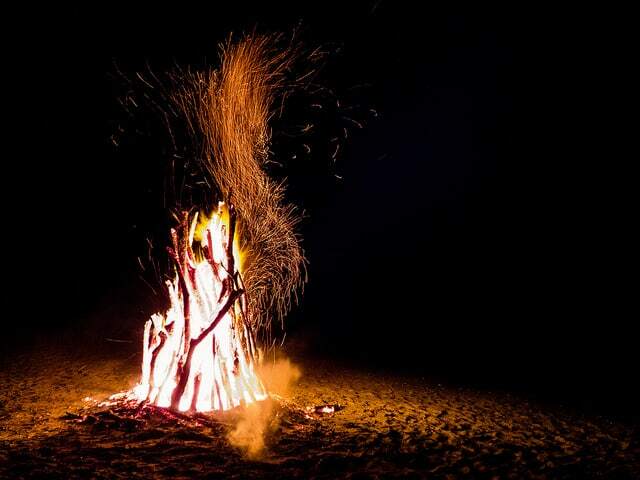 Bonfires featured significantly in ancient, Celtic celebrations of Halloween or Samhain. Here’s what must be done to encourage dreams of your future love. Simply snip a few strands of your hair, and drop them into the burning embers of a Halloween fire. The magical flames of your burning hair will encourage vivid dreams of your future spouse. I hope he or she will fulfill all your dreams. Apples were also used for telling the future on Halloween night. When I was a little girl in Dublin, most home owners shared apples and nuts with trick or treaters, rather than candy or sweets. In recent years I have come to appreciate how this custom was rooted in age old traditions. 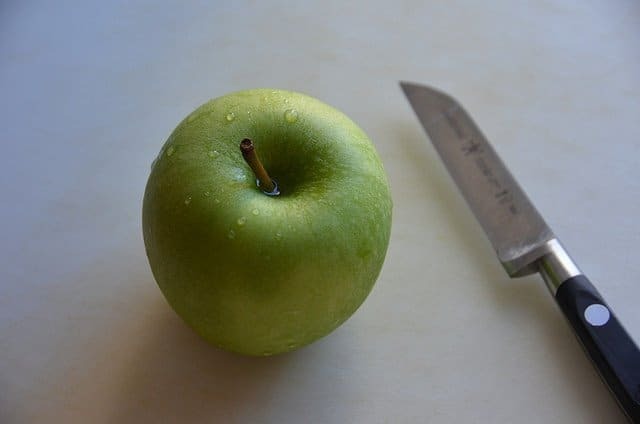 The apple peel love test may have originated in Scotland rather than Ireland, but this trick was practiced throughout the British Isles. A little apple peeling skill is required for this one. First you must peel an apple all in one go, creating a long strip of peel. Love awaits only for those who can remove the peel with no breakages. The peel must then be thrown over the shoulder. As it falls the peel may land to reveal the initial of a would-be suitor. Love is an apple peel – it sounds like the name of a song. If you’re still interested in finding out if your spouse will be bitter or sweet, and don’t have time to go pulling cabbages to cook, then never fear. A hazelnut will reveal your future love’s temperament, just as accurately as a trusted cabbage. Simply pick out the hazelnut you believe represents your future love. Crack the shell and taste. You’ll quickly learn if a sweet or bitter nut awaits in your future. And there’s even more romantic news to be uncovered through these powerful nuts. If you want to know if your future marriage will be full of happiness, then you and your partner must each choose a hazelnut. 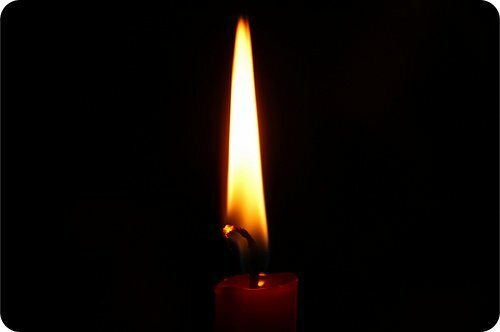 Light a match between the two nuts (only do this on a flameproof surface), and watch how your two nuts react, not only to each other, but to the flame of love burning between them. Remember our forebears had stone hearths for these fiery tricks, so don’t do anything dangerous. If the nuts burn quickly, then alack and alas, the future marriage may not be strong, and may be at great risk of crumbling when life gets tough. Now if your two nuts do a little dance and move away from each other, then proceed to marriage with caution. If your hazelnuts hop closer together, moving towards the flame of love, then future happiness is yours. Believe it or not, these trusted nuts hold even more secrets of the future. 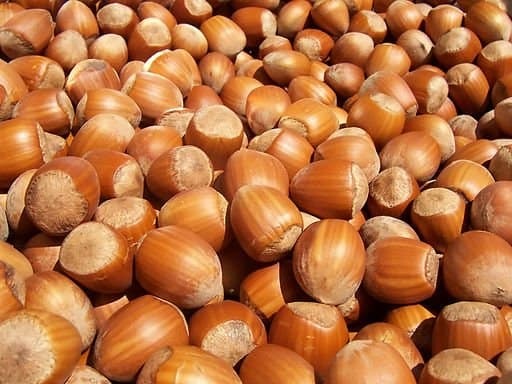 Hazelnuts can be used to choose between potential beaus. In the past, inquisitive young women determined which admirer might be faithful, by choosing three nuts, and naming them after the young men she wished to test. The three nuts were placed upon the bars of the fire grate. If a nut cracked or jumped, then that lover might be unfaithful. If the nut burned brightly then that beau held a flame for the girl performing the hazelnut trial. This test could be taken a step further by adding a fourth nut, named after the girl. If her nut and one of the nuts named after a potential suitor blazed together, then love was assured and marriage inevitable. 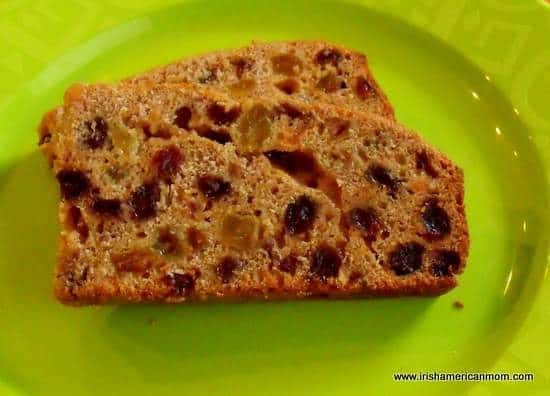 Traditional Irish Halloween celebrations involve serving an Irish cake called brack. 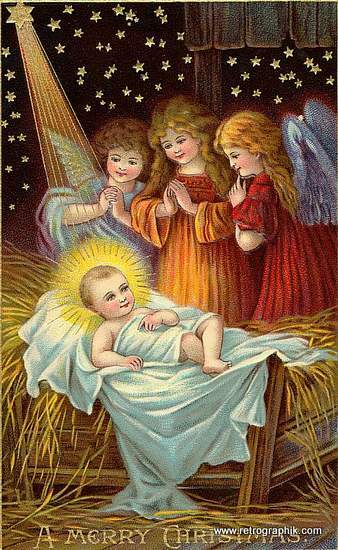 This tradition continues to this day. These raisin breads are baked with hidden treasures in the dough, usually a coin, a piece of cloth, a key, a ring, a thimble or a button. Lucky Halloween revelers who discover the coin can look forward to a year of prosperity. But I’m afraid your finances look bleak if you find the old piece of cloth. Of course, the ring foretells an impending marriage, or a new romance. But if you find the thimble you’ll be an old maid. A button foretells a year of bachelorhood for a male barmbrack eater. And a key tells the story of an imminent journey. Now if you don’t have time to be baking fancy barmbracks with rings and things inside, do not fear. A simple bowl of porridge will do the trick. 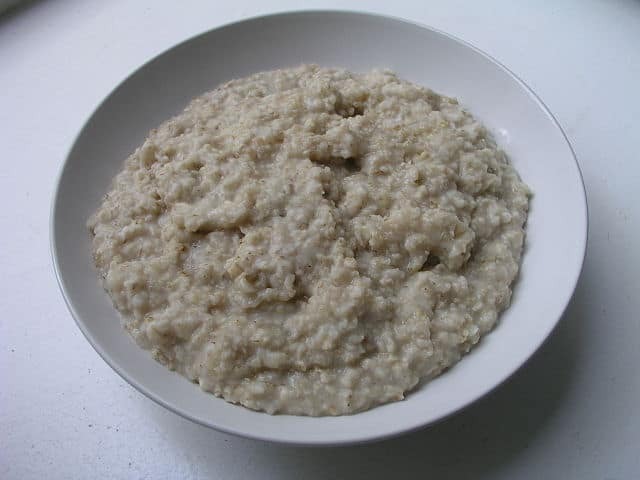 Fuarag (pronounced foo-ur-ag) is a traditional dish of oatmeal mixed with cream. If you’re eager to learn if new love is just around the corner for you or one of your friends, just make a big pot of porridge. Add some cream, a ring and a coin. Dish out the porridge to all those seeking to know if their future holds marriage or wealth. The lucky finder of the ring will be married within the year, while wealth awaits whoever recovers the coin. And hold your breath if your bowl of creamy gruel reveals both the ring and the coin – a wealthy spouse may soon cross your path. Remember to eat with caution on Halloween night – all these bits and pieces in traditional foods are a major choking hazard. 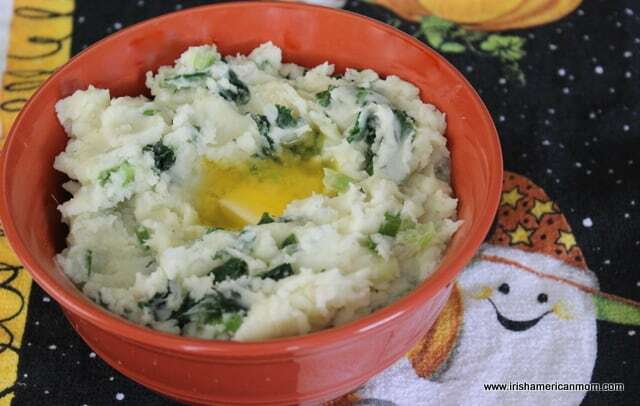 Colcannon is a traditional Irish dish served at Halloween. It’s a mix of kale and mashed potatoes, served with melted butter, and once again this simple dish holds the powers of divination. 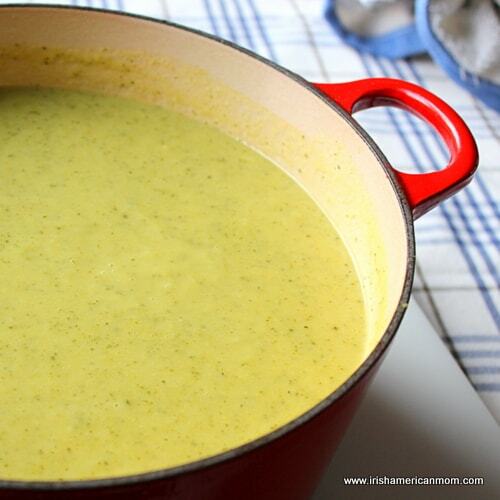 In the past, unmarried women would take their first and last spoonful of colcannon and put it inside a stocking. These colcannon stockings were hung from the frame of the front door. The first man to enter the house and pass beneath the fortune telling stocking would become their husband. And there you have it – my romantic guide to Halloween festivities. If you know of any more prophetic Halloween traditions concerning love and marriage, please feel free to add your two cents worth in the comment section below. I look forward to hearing new superstitions from all over the world. Wishing you all happy love matches this Halloween. 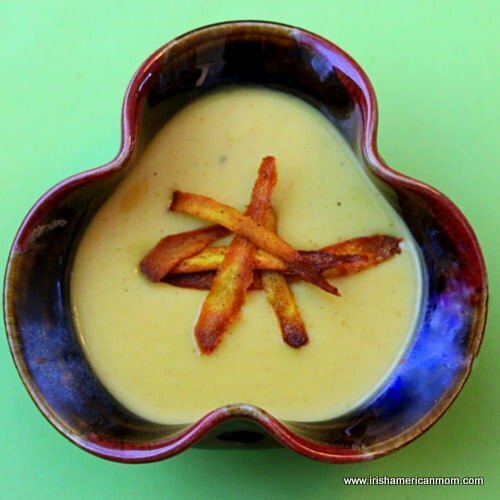 Curried parsnip crisps are a perfect garnish for soup, a healthier alternative to store bought crisps or chips, or a simple tasty snack. Baked in the oven, these crispy vegetable wafers can be seasoned and spiced up whatever way you choose. 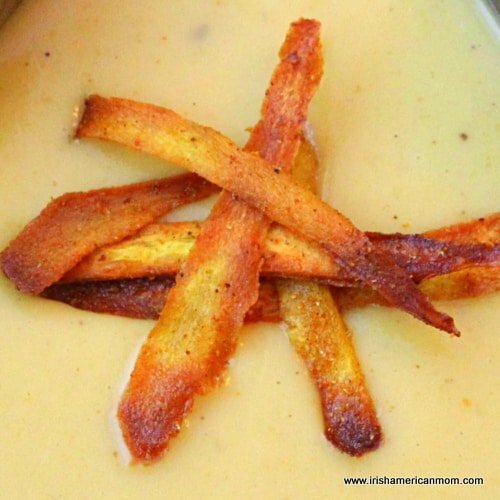 I love to add these flavorful parsnip shavings to the top of parsnip and apple soup -they’re a simple, elegant garnish. They’re also great to pass around as nibblers with soup. Parsnip crisps is what I like to call these tasty morsels, but I suppose in America they might be called parsnip chips. However, these shavings are thin and crispy, not thick and chunky like an Irish chip, so the name parsnip crisps describes them perfectly. And you won’t believe how easy they are to make. Peel the parsnip, and discard the skins, so you won’t get them mixed up with the parsnip shavings. Using the vegetable peeler, scrape thin wafers down the length of the parsnip. Don’t worry if they split halfway down. Keep turning and shaving the parsnip until you reach the woody core at the center. Throw this away, since it produces coarser, less tasty crisps. (If, like me, you go by the motto waste not want not, you can always toss the parsnip core into the pot when you’re making stock). 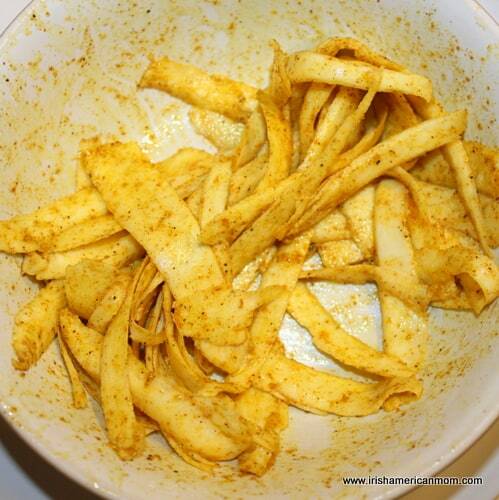 Next, pour the oil into a bowl and mix in the curry powder. I love the flavor of curry with parsnips. Season the oil with salt and pepper if desired. I find these crisps are just fine without any added sodium when spiced up with curry powder. Chili and Mexican spices work well too. Feel free to experiment with your favorites. Next, toss the parsnip shavings in the seasoned oil to coat them fully. 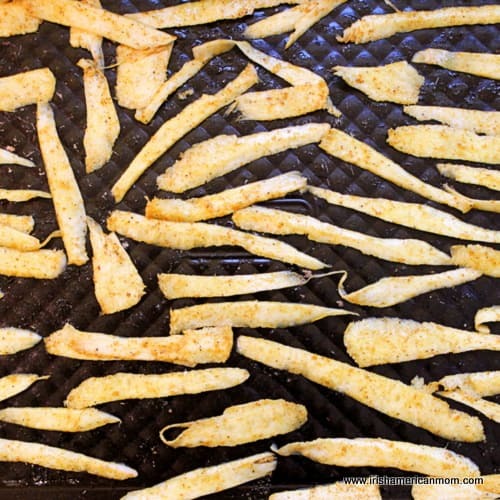 Parsnip crisps can be deep fried in oil, but I prefer to bake mine in a hot oven. Lay the parsnip shavings in a single layer on a baking tray. Pop them in the oven for about 5 minutes. 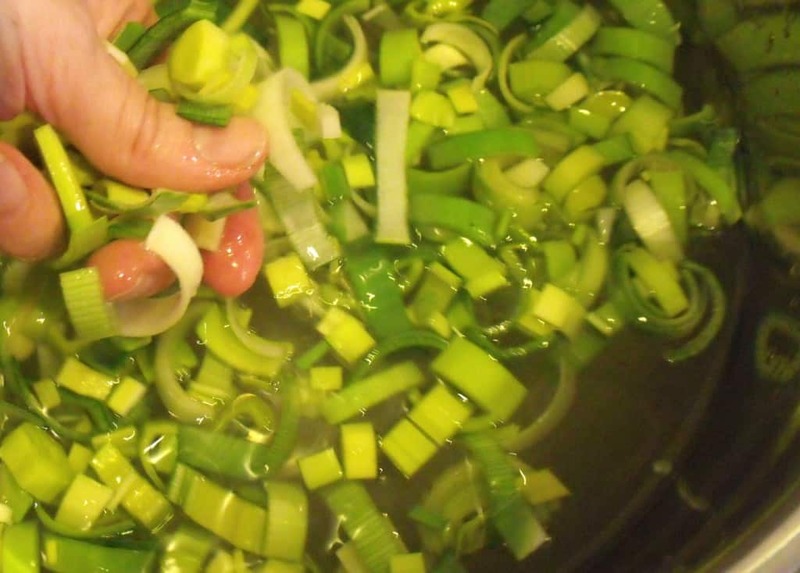 Turn them at this point, and then pop them back in for another 5 to 10 minutes. These crisps are very thin, so they can burn easily. Since temperatures vary from oven to oven, watch them closely so they do not burn. 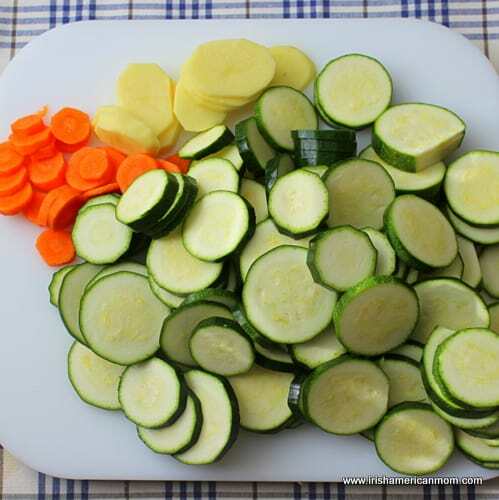 Remove them from the oven and lay them on some paper towels to remove any excess oil. Once they cool a little they’re ready to eat. I just can’t help sneaking a few before they ever adorn a soup bowl. 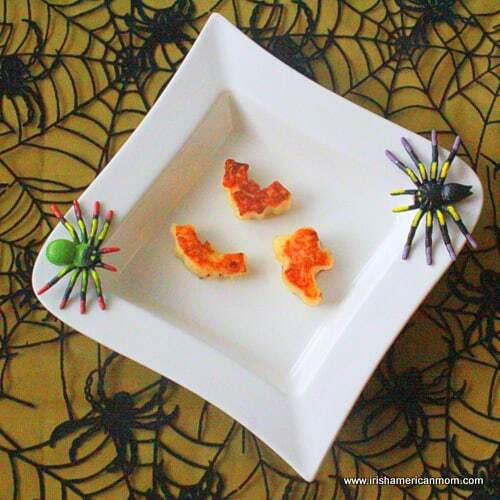 These little snacks are simply delicious, and my kids love them. 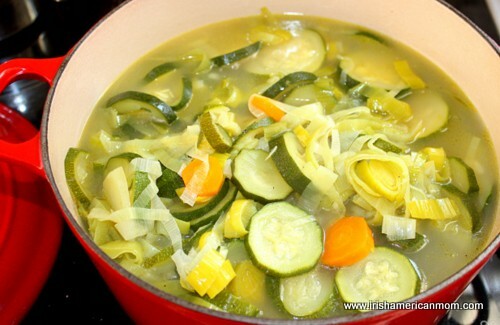 I hope you enjoy this recipe for a simple vegetable garnish to dress up soups. 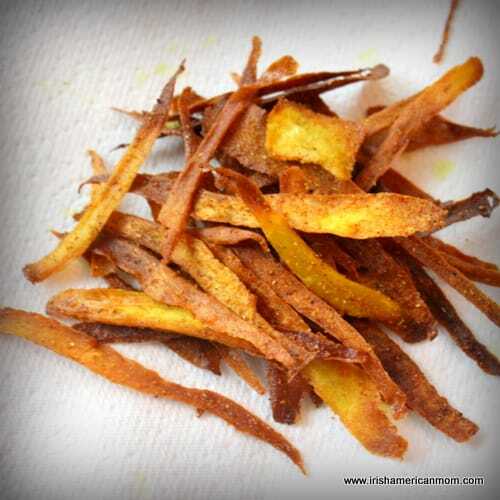 Parsnip crisps are a healthier alternative to store bought crisps or chips, and are a simple tasty snack. 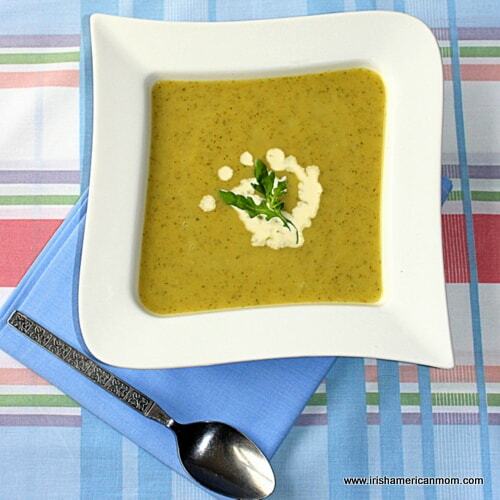 They can even be used to garnish soups and salads. Step 1 Pre-heat the oven to 400 degrees Fahrenheit. Step 2 Peel the parsnip and discard the skins. Using a vegetable peeler, scrape thin wafers down the length of the parsnip. Keep shaving the parsnip until you reach the woody core. Throw this away. 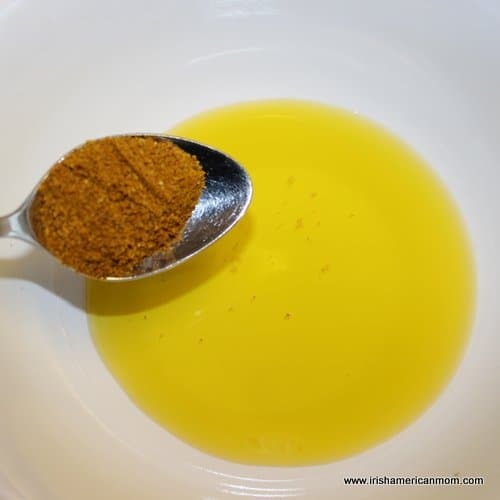 Step 3 Pour the oil into a bowl and mix in the curry powder. 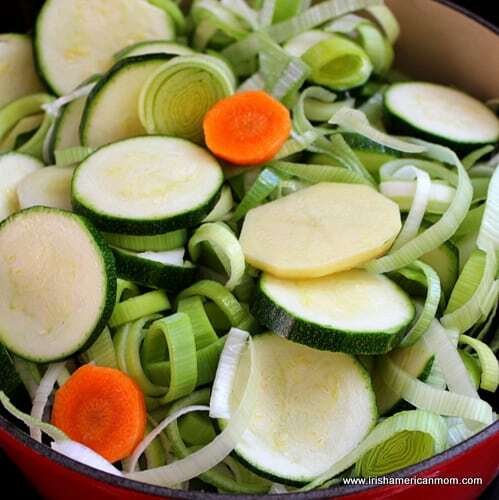 Toss the parsnip shavings in the seasoned oil to coat them fully. Step 4 Spread the parsnip shavings in a single layer on a baking tray. Step 5 Bake in the 400 degree F. oven for 5 minutes. 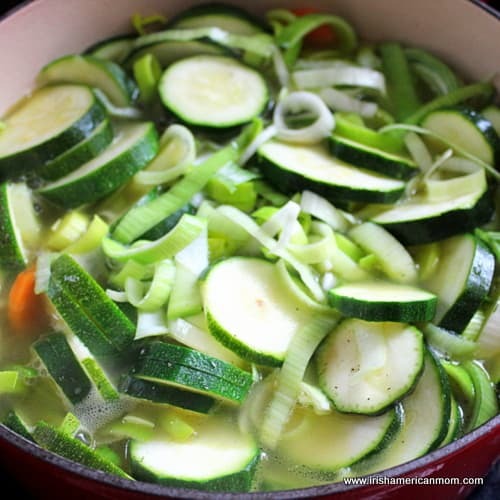 Turn them at this point, and return them to the oven for another 5 to 10 minutes. Check the parsnip crisps frequently, since they can burn easily. Step 6 Transfer the cooked crisps to a layer of paper towels to cool. 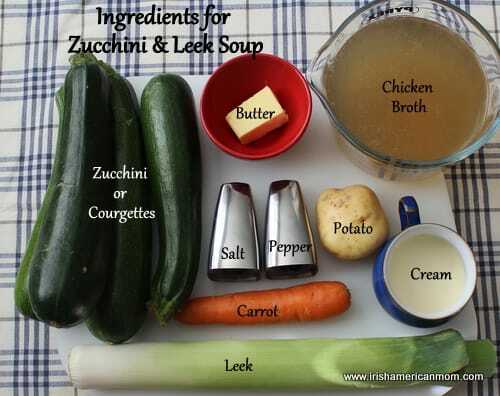 Step 7 Serve as a snack, or use to garnish soups and salads.